Magnetic resonance scanning (MR-scanning) or magnetic resonance imaging (MRI) is superior to CT and radiography for detecting early sacroiliitis because MRI can show active inflammation in addition to structural damage. In later stages MR can provide valuable information about disease activity corresponding to the sacroiliac joints as well as the spine. MRI is therefore appropriate for measuring the disease activity and can be used to monitor the disease with regard to indication for treatment and for assessing the effect of therapy. MRI is based on a rather complicated technique. The images can be obtained in numerous ways related to different MR sequences and it is possible to obtain images in arbitrary scan planes. It is important to choose the most appropriate sequences and slice orientation for each specific diagnostic purpose. During image interpretation, the radiologist must be familiar with normal MRI findings and the appearance of diseases that can simulate sacroiliitis or spinal changes as part of spondyloarthropathy (differential diagnoses). Positive MRI and negative radiography and CT examination. 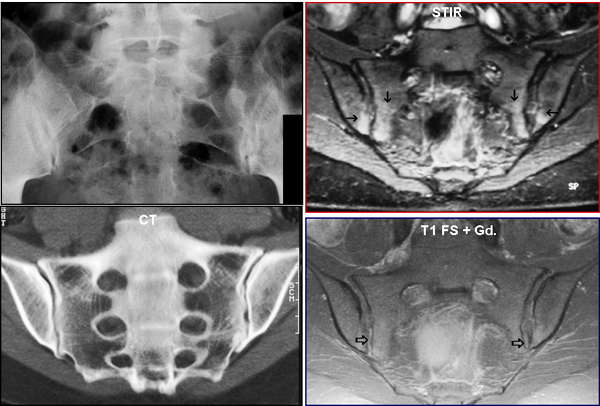 The images show normal sacroiliac joints by radiography (top left) and CT (lower left image), but active inflammation by MRI in the form of oedema on the STIR image (top right) and enhancement after intravenous Gd. contrast (bottom right)(arrows).